You have just been tagged to play the Name Game. Didn’t he also say something about working with Iran and Syria? That would have been hard to take for many of them I’d imagine. But then he did also promise them a pay rise, which got a cheer. FYI, I consider meme-whoring of this type only a couple of steps above out-and-out spamming. Pablo, three of the depicted squaddies are also probably African American. (Interestingly, several of the white boys have wierdly similar facial features. Photoshop, or a West Virginian unit?). Pablo, three of the depicted squaddies are also probably African American. How does that remove the shock (awe?) of being led by a black C-I-C? It’s a Getty image. I doubt photoshop. The first thing that struck me was how much lighter Obama’s skin colour is than the African American soldiers’. I’ve often wondered how much it matters that he’s not African American in the same way that most African Americans are. The second thing was the body language in the audience. Quite a few soldiers are leaning forward and only one is leaning back-and-away – so the audience looks engaged. Two of the soldiers have their hands over their mouths which is often a signal of holding back speech, I wonder if, in this case, it’s a sign of engagement and effective rhetoric from the speaker which calls for a response. Obama has equivocated, backflipped, and double talked most of his time as President, I don’t think they have any more reason to believe the words coming out of his mouth than those that came just as awkwardly out of Bush’s. I’m surprised no one has mentioned that there are no female soldiers to be seen in that photo. Also what is with the blurring of Obama. The blurring effect is what makes this photo so powerful. It’s not a photo of Obama as commander-in-chief – it’s a photo of those he commands, being commanded, and their reactions to it. Well, to elaborate on my last comment, I think the cracking thing about this photo is that it shows that the military, who are trained to be, and we are trained to see as, a united front bound by doctrine and loyalty, are made up of individual people responding in their own more or less complex ways. 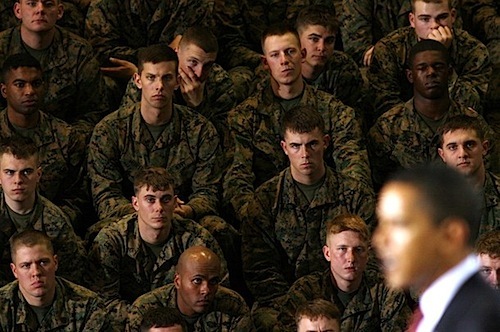 Young, strong men, brave and frightened, certain and doubtful, clear of mind and confused, engaged and bored – these are the cream of the crop chosen to sit on the front bleachers at a major presidential event – and that doesn’t happen by accident. Anita, I think you’re wrong about posture coaching – if they’d been enjoined against crossing arms they would have been similarly enjoined against slouched shoulders and leaning forward and hands to faces – they’d be sitting to attention; but they’ve either been given leave or have lapsed into their own positions. I think the range of (well, what we can imagine as) responses in this photo is stunning – disbelief to suspicion to outright hostility to glazed absence of cognition. Speech bubbles would be an interesting project. I don’t see hope on any of their faces, though – not even the black soldiers. And yeah – where are the women? I’m somewhat disappointed that Pablo denigrates soldiers by calling them brain dead, and further insinuates they are racist. Yeah, it’s a moment in time – he could have been talking about new uniform regulations or something equally dull, for all we know. The thing which makes it so open to interpretation is that there’s no way of knowing what specifically what he’s talking about. This is why it’s tagged `rorschach’ – responses tell us at least as much about the responder as about the thing they’re responding to.